Cosmic Colours is based in Doncaster ideally located to provide our Mobile service around the South Yorkshire region. 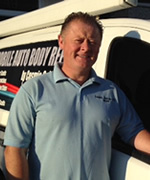 My name is Mark Turton, I have over 20 years experience in Car body repair, starting with a brief spell at Toyota as a Paint Sprayer and later working for a national smart repair company for a number of years. I set Cosmic Colours Limited in 2007. We provide services for both private and trade companies and also repair lease vehicles. I pride myself and Cosmic Colours in providing a competitively priced, high standard of work and a friendly and reliable service. I specialise in SMART repair... small to medium area repair technique not all damage is repairable many factors inluding where on the car the damage is and colour can decide if a smart repair is viable. I always advise on the best option to get get your car back to how it was. We arrange a convenient time to call around to your home or work place and assess the damage and repair work needed and offer a completely free quote, or you can send images with a brief description and your contact details to my email address [email protected] and I can usually quote you within hours.